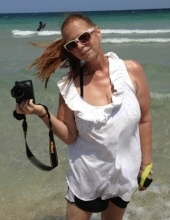 DURHAM: Cyndi Lee Macneir, age 59, passed away after a long tough battle with cancer on Sunday, March 24, 2019 at her home in Rougemont surrounded by family. Born in Camden Co, NJ to the late Kenneth Charles Kessler I and Jean Doris Rohm Kessler. Cyndi leaves behind to cherish her memory, husband, Jeff Macneir, daughter, Krysti Lee Macneir, sons, Matthew Macneir (Ashley), Michael Macneir (Jennifer), Barry Macneir; sister, Cheryl Stacey (Mike); brothers, Kenneth Kessler II (Judy), Brian Kessler, Scott Kessler; grandchildren, Allison McGuire, Jacy Macneir, Mathew Macneir Jr., Ellie Macneir, Violet Macneir, and Georgia Macneir. She will meet in heaven her step son Todd Macneir and brother Kevin Kessler. Cyndi was a beautiful, kind and talented woman that loved her family and friends with all of her being. She also loved photography, crafting and all the holidays. A memorial service will be held privately at a later date. In lieu of flowers, the family request that memorial donations be made to her favorite church, Living Water Community Church: 1501 Riverland Road, Fort Lauderdale, FL 33312. To send flowers or a remembrance gift to the family of Cynthia Lee Macneir (Kessler), please visit our Tribute Store. "Email Address" would like to share the life celebration of Cynthia Lee Macneir (Kessler). Click on the "link" to go to share a favorite memory or leave a condolence message for the family.